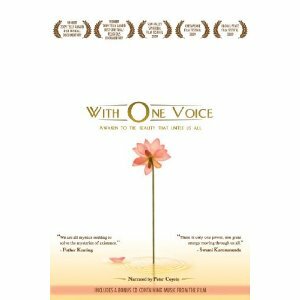 With One Voice brings together mystics from fourteen different spiritual traditions to share their perspectives on the unifying truth that transcends all religions. In this seventy-eight minute documentary, these awakened teachers address profound questions about life and love, the existence of God, the path to spiritual awakening and the way to true peace in the world. Through their words and compelling presence, they ask us to look within our own hearts and listen deeply, so we too can join the conversation and speak With One Voice. With One Voice shares the eternal message and wisdom of the mystics. This illuminating documentary explores the unity of humanity, reveals our essential oneness and spreads the single message that binds all faiths together. The film features mystics from many of the great spiritual traditions around the world, whose lives have been dedicated to answering the mysteries of existence. For mystics, all of our problems stem from a loss of connection with the infinite source that sustains us all and their solution is simple; reconnect. Featuring Swami Karunananda, Sadhguru Jaggi Vasudev, A. Hameed Ali (A.H. Almaas), Ajahn Amaro, Rabbi David A. Cooper, Dr. Mohammad Faghfoory, Sheikha Fariha al Jerrahi, Gangaji, Joseph Goldstein, Bhante Henepola Gunaratana, Joan Halifax Roshi, Father Thomas Keating, Derek Lin, Wayne Liquourman (Ram Tzu), John Daido Loori (Roshi), Marcelle Martin, John P. Milton, Yongey Mingyur Rinpoche, Grandmother Lillian Pitawanakwat, Reb Zalman Schachter-Shalomi, Dr. Malidoma Patrice Somé, and Brother David Steindl-Rast.